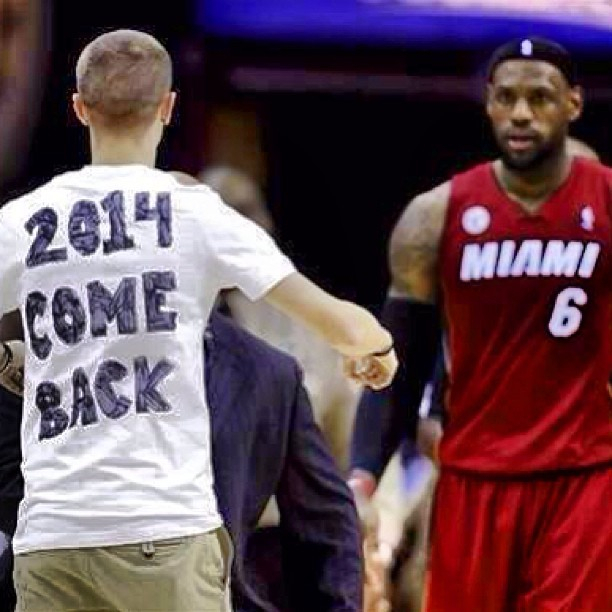 I wonder if LeBron James ever looks forward to returning to Cleveland? I’m sure you already know his exit from the Cavaliers was less than stellar, so any time he and the Miami Heat are slated to return to fair Cleveland for a game, everyone’s bloomers get in a bunch. This time, according to ESPN, at least one person in the arena was happy to see LBJ. This game had a little of everything, including a fan running on the floor in the fourth quarter. The young man was wearing a T-shirt that said: “We Miss You, 2014 Come Back,” a reference to James’ possible free agency and return to Cleveland, where he played seven seasons. He also embraced the challenge to help bring his team back from a first-half 21-point deficit. The Heat went on a tear in the second half, outscoring the Cavs 40-12 at one point, and finished the game victoriously with a final score of 98-95. They preserved their record-breaking winning streak (it now stands at 24), and James delivered yet another triple-double to add to his career stats.